Description: Has 10 spline hole, top tie rod hole is .640 inch, bottom tie rod hole is .750 inch. From center of splined hole to a line between the center of tie rod holes is 5.25 inches. For tractor models (1550, 1555, 1650 all with adjustable axles), (1600 with adj. axles Serial Number 124420 and up), (1655 adj axles narrow tread Serial Number 147569 and up), (1750 adj. axles narrow tread Serial Number 180537 and up), (1755, 1855 adj. axles marrow tread Serial Number 220000 and up), (1800 adj. axles Serial Number 115377 and up), (1850 adj. axles Serial Number 150421 to 168127), (White 2-62 with adj. axles Serial Number 160000 to 168915). New, aftermarket Oliver 1555 Steering Arm for sale with a solid manufacturer warranty. In addition, we have a generous 30-day return policy if this item needs to be returned for any reason. Please see our Parts Warranty and Return Policy links on your left for complete details before returning. 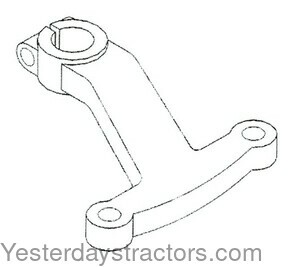 ABOUT THIS PAGE: You are viewing the product page for our Oliver 1555 steering arm. As one of the largest suppliers of new and rebuilt Oliver 1555 tractor parts we most likely have the steering arm you need. Use the information above including the steering arm part number and picture (if available) to assist you in making your decision to purchase. If you are looking for a different steering arm, or have trouble locating the Oliver 1555 parts you need, we have MANY parts that are not listed on our website so feel free to contact us.